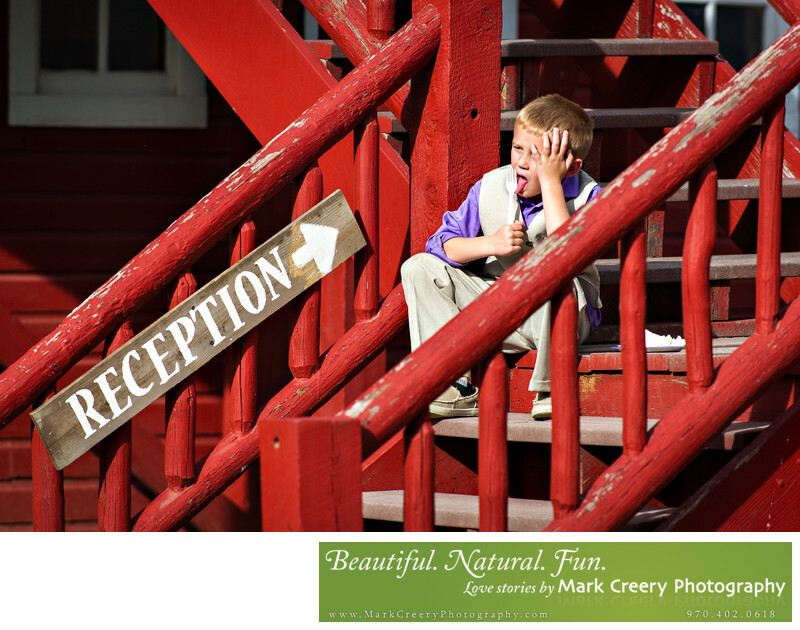 This candid photo of a kid attending a wedding reception at Wyoming Hereford Ranch in Cheyenne is a fun example of why I love taking unscripted photos. He had just finished his cake and was licking off the last of the icing from his fork. I love that he was hanging out away from the guests on the steps of the barn where the reception was taking place and just having his own time with his dessert with his head leaning on his hand. The reception sign adds the needed context for the image, pointing past the child to where the fun is happening. Instead of just focusing on the activity inside the reception venue, I like to walk around to find different perspectives. Sometimes outside the venue you will find kids having a great time and goofing off - perfect for some off-the-cuff photos that the couple never knew actually happened at their event. I love taking photo-journal style photos like this one. If you're looking for a wedding photographer in the Cheyenne area, check out why couples are raving about Mark Creery Photography. I excel at capturing your personalities while still showing off the scenery that your Cheyenne venue has to offer.